“I can’t believe you’re putting on mascara right now,” the woman said to me in the bathroom of the eco-resort in Patagonia. I was fresh from my first shower in a week. 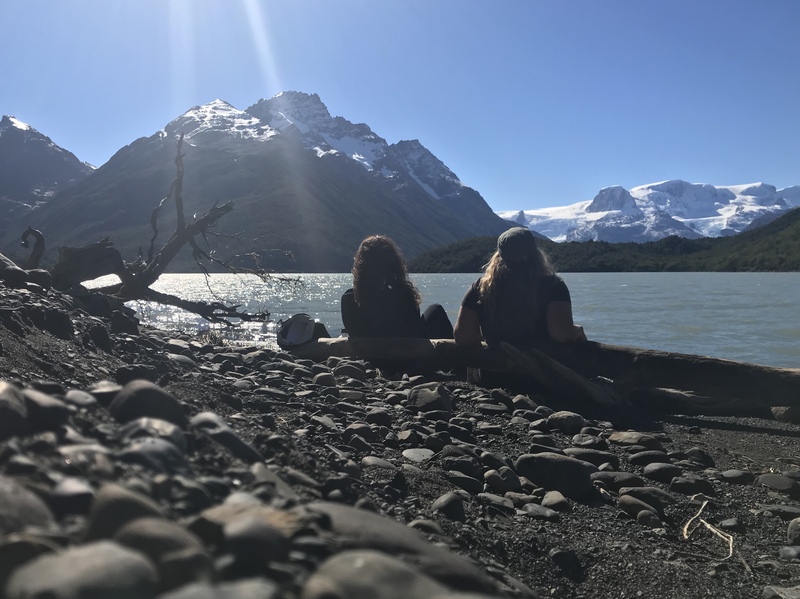 I’d just finished backpacking the O Circuit in Torres del Paine with my friend Ellyse, who swiped gloss over her lips next to me. “We’re in the mountains. Who cares what you look like? I’ll see you when you’re done primping,” the woman sneered as she walked out the door. I met Ellyse’s eyes in the mirror and registered the same surprise. We’d only met this woman a few hours ago; we had zero insights into her motivation for shaming us for putting on a little light makeup on the other side of a multi-day backpacking adventure. I absolutely agree that as women, our efforts and accomplishments in the outdoors should be celebrated independent of our looks. On that score, Ellyse and I had just backpacked 75 miles over several mountain passes. We’d wallowed in our dirtiness for those days, too lazy to take advantage of the showers at the backcountry lodges along the way that others lined up for. We generally glorify in the mirrorless freedom of the wilderness, accustomed to being covered in trail dust and wearing the same increasingly smelly shirt. But this woman knew none of that. She only knew that I put on mascara at a hotel in the mountains, and apparently pegged me for not being “outdoorsy enough” to go au natural at all times. I remember a friend of mine who told me about a woman she worked with on a ship that sailed blue water documenting the five gyres of trash swirling around in the ocean. She wore red lipstick every day in the middle of the Pacific, and she called it her superpower. That’s exactly how I feel about mascara. It makes me feel invincible. So yes, I’ll wear it at the eco-lodge after my first shower in a week post-backpacking, and I refuse to be shamed out of it. The woman’s comment made me think back to this story I wrote for Travel & Leisure about how Instagram is skewing the way we see women in the outdoors, in which I criticized the type of imagery that makes many women feel like we have to worry about what we look like in the backcountry. In looking back, perhaps those women that post the type of photos that I called out—“hyper-curated images of perfectly coifed women in fashion outdoor apparel staring out at stunningly beautiful landscapes”—felt just like I did in that bathroom in Patagonia when they read that story: surprised, and offended to be judged by someone who had no context for how they approach their time in the wild. Granted, the point of that story was that those photos tend to portray an unrealistic image of women in the backcountry, one that focuses on looks rather than skill, fun, accomplishments—and dirt, let’s be honest. But that doesn’t mean that the women who favor the hyper-curated photos are any less of outdoorswomen than the women who consider themselves “purists”. Now I might write that story a little differently—still with the focus on how social media can support the accomplishments and skills of women in the outdoors rather than focus on the classic media fallback to our looks—but also with the perspective that there’s no hierarchy of outdoor women. Just because some women choose not to wear makeup or deodorant or shave their legs while others choose to do those things doesn’t mean one category is more authentic than the other, or better at adventure sports, or stronger, or more skilled, or more badass. Just because I wear mascara in the frontcountry doesn’t mean I’m a weaker backpacker than the woman who doesn’t (and frankly, it’s backpacking—we can all be good at that, even in fashion apparel). Ultimately, less time spent shaming each other means more time spent supporting each other in rad adventures and successes to lift up women in the outdoors as a whole. I resolve to take my own advice in future stories. I’ve felt shamed for maintaining my femininity while participating in outdoor activities. It seems odd that some people think a woman can’t be strong and capable and feminine all at the same time. Want to follow my directional detour? Get updates and blog posts via email.